There is a wide choice of 11 kV switchgear to choose from including oil break, air break, vacuum or sulphur hexafluoride (SF6). The switchboards are either metalclad or metal-enclosed designs with withdrawable circuit-breakers. The bulk oil breaker board is probably cheapest but suffers from the risk of fire, high maintenance costs and a limited number of operations between overhaul. Vacuum gear is attractive where a large number of operations is envisaged but it has a relatively low fault breaking capacity and may impose a switching overvoltage on connected equipment. Air-break gear has a good fault rating, has low maintenance costs and has no fire risk but is very bulky and is expensive. of view of space, maintenance and safety. but less secure system without the earthed metal barriers between circuit chamber and busbars. There is a risk with such an arrangement that circuit faults will develop into busbar faults thus shutting down a whole network. 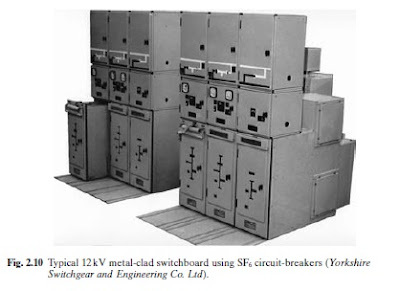 There are a number of variations to the main types of supply switchboard to suit particular circumstances; for example, double-bus switchboards where the circuitbreakers may be connected to one of two busbars; vertical or horizontal isolation; full interlocking to prevent operation of the circuit-breaker in the wrong position or withdrawal when closed; integral earthing where the circuit-breaker can earth either the circuit or the busbars when selected to do so; secondary isolating contacts which can be arranged to allow testing without danger to the commissioning staff; bus-section circuit-breakers; extensibility on either side of the switchboard; h.v. cable test facilities; and current injection test facilities. There are also a wide variety of operating mechanisms to suit site conditions such as: independent manual closing; hand-charged spring-operated power closing mechanism with or without an electrical release; motor-charged spring-operated power closing mechanism; and solenoid closing mechanism. There are also a number of 11 kV units which have been specially designed for ring-main supplies as discussed earlier. These usually consist of oil switches on the two connections to the ring and either an oil fuse-switch or exceptionally a circuitbreaker on the transformer tee connection. The oil switches are normally able to close on to a fault and to open full load current safely. This is an economic way of providing a secure supply and is widely used in the UK. The ring-main unit can conveniently be provided as part of a package substation (discussed later) including the transformer and 400 V distribution fused pillar. Such a unit can be completely enclosed in a weatherproof cubicle and transported to site in one piece. The cubicle also serves to keep out of danger members of the public or staff who are not concerned with its operation or maintenance.